Say what you will about Android(s goog) versus iOS(s aapl), but there’s no denying Apple has managed to cultivate a high-quality, vibrant ecosystem of tablet-specific apps. If you own an iPad, you have access to more than 375,000 apps at your fingertips right at this very moment. But what’s even more important is that they’re easy to search for and find. Trying to find Android tablet apps, on the other hand, can be an exercise in patience, frustration, and ultimately, futility. This story started off as an app comparison between Android tablets and the iPad. But it quickly became clear that searching for Android tablet apps is no easier today than it was when I first laid my hands on the original Samsung Galaxy Tab nearly three years ago. Why? Unlike in the world of iOS, there’s no clear, simple separation on Google Play between phone apps and tablet apps. It became clear I’d have to take matters into my own hands if I was going to find some genuine Android tablet apps, and I’ve outlined the best strategies I discovered while doing so here. There won’t be a foolproof way to search for tablet-optimized apps unless Google provides a distinct separation between the two in Google Play, but these tips are your best bet for finding what’s out there right now. Google may not make any distinction between phone and tablet apps in the Google Play store, but it does offer you some guidance. Take out your tablet and fire up Google Play. It will automatically recognize that you are using a tablet and offer one or more menus filled with-tablet optimized apps. Look for “Tablet 101,” “Tablet Highlights: More Apps for Your Tablet” or “Staff Picks for Tablet” to get yourself started. These are a great place to start, but only offer a handful of apps. Open up the web browser on your tablet. Run a search for “Android tablet apps.” The first return you see should be a page for Google Play’s store on the web, highlighting “Featured Apps for Tablets.” There are also plenty of good app roundups there. Not only will they point you towards tablet-optimized apps, they’ll show you the best ones you can find. You won’t get anywhere by typing in calculator and just hoping for the best. Instead, add some words to your search to help guide it. Try Calculator Tablet or Calculator HD. You can even try adding the name of your tablet (or the current most popular Android tablet) to your search, like Calculator Galaxy Tab or Calculator Nexus 7. Yes, you can read through app descriptions in the hope of locating the words tablet optimized, but they are often buried in the middle of lengthy descriptions and difficult to find. A faster, easier way to tell if an app is made for tablets is to check out the screenshots. If you see any in landscape orientation (horizontal), that’s a good indication the app is tablet-optimized. Keep in mind that not all tablet apps work in landscape, though, so read the fine print if you want a definitive answer. Until Google creates a way to distinguish between tablet and phone apps, your best bet is to download an app that does this for you. Tablified Market is a great place to start. 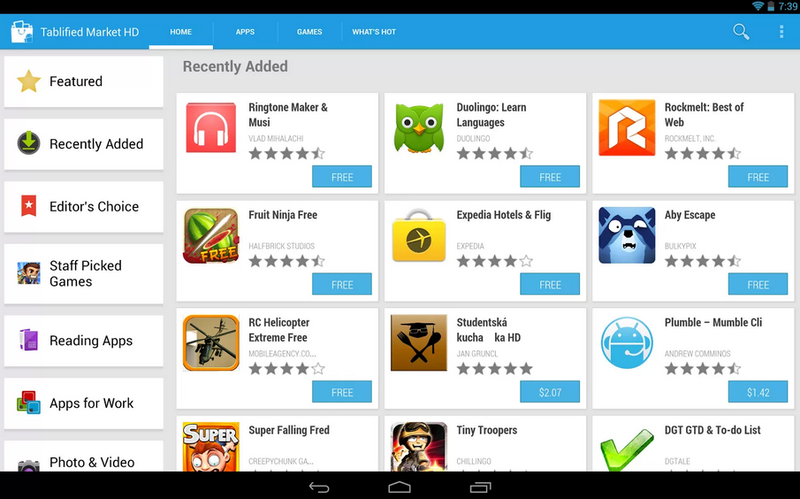 It shows a clear, curated list of third-party apps that are specifically designed or optimized to work on Android tablets. It’s how Google Play should work. Just because an app isn’t optimized to run on your tablet doesn’t mean you can’t use it. You can still run the app in a phone-size window with a bunch of empty space around it, or you can stretch it out and blow it up to fit your tablet’s screen. Neither of these options is optimal, but it’s better than not having access to the app at all. And you might even get lucky and find the app is optimized to work on your tablet, but didn’t say so in the app description. All images from Google Play. Android running after iOs to catch on tablet optimized apps! So better choose the one who is way ahead of the other. Isn’t it? Anyone tried Slideme Marketplace or oher Android specific sites? Well I’d start with #5 since it’s raison-d’etre is displaying tablet optimized Android Apps! And secondly, the reason this is difficult for Google to do, is that unlike iOS, where the Phone only apps look like cr*p on a tablet with the rasterized scaling, Android apps with device independent pixels and relative layouts scale well. But it’s a double edged sword. Just because it scales well, doesn’t make it “optimized”. A responsive UI needs to take advantage of the extra space available and change layouts. Using Fragments is a start, but still may not create a responsive user experience. No different than a universal app on iOS that merely makes an iPhone app run in an iPad. Is that considered as a tablet app by Apple? Most Android apps are already tablet ready which is why there are so few to be counted. Some are “tablet optimized” but most can be effectively used the same on a phone as a tablet. That’s why you can’t count iPad apps vs Android tablet apps. I don’t remember ever having a problem with an app downloaded onto my Nexus 7 where not being “optimized” was a problem. Maybe that’s why they aren’t segregated. I’ve had some apps update where one of the improvements was to be optimized for tablets, and I haven’t noticed the difference. Life is too short to invest that kind of effort when a better option is available. Buy an iPad. If/when Android catches up and offers the same ease of experience, consider switching. I wish I could get back all the time I’ve wasted in my life wrestling with things that I wanted to be good but weren’t. I get heartily sick of people saying “life is too short”!!! Life is the longest thing you will ever do!